The Innovation Portal is a joint project between the University of Dundee, the University of Abertay, Dundee, and The James Hutton Institute (formerly the Scottish Crop Research Institute). 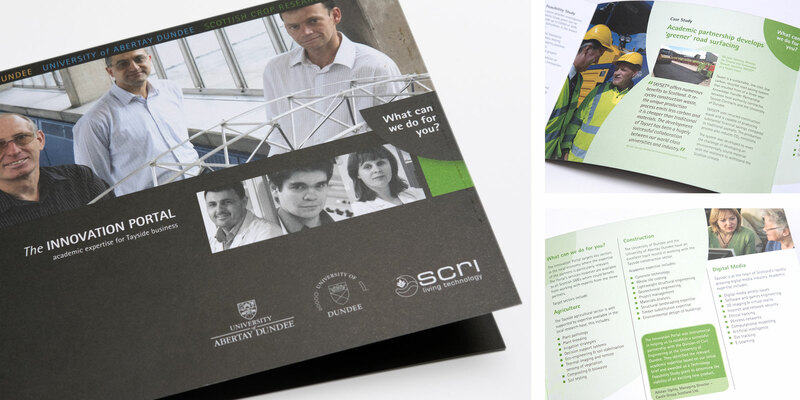 For this project we designed and developed a range of coordinated corporate materials including: brochures, events materials, and graphic displays. The role of The Innovation Portal is to nurture relationships between industry and academia by promoting collaboration and knowledge transfer. Such relationships are possible for any size organisation where the need and skills can be matched. The theme of the communication materials centred on the idea that academics are available to assist industry by positioning academics alongside the question – What can we do for you?